Julia's Cards: Do you enjoy playing with digital images? Stampin' Up! have a product call My Digital Studio (MDS for short) and it's all about using the wonderful images and art works from the Stampin' Up! catalogues on a digital format. You can design cards, photos books, scrapbooking pages etc and you can create it without leaving the warmth of your computer! hehe. Now I will say that this is fairly new to me, I haven't printed off anything I've designed yet - mainly cause I've only designed one project! LOL! SO I am going to go the "Make a Statement Digital Tour" in September where in an afternoon you learn how to get the most out of the program. 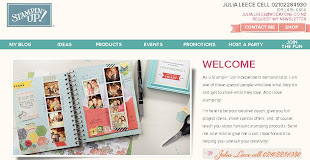 Here is some info about the event direct from Stampin' Up! At the events learn how My Digital Studio can fit in with your life and your style to help you become your own digital designer-creating cards, invitations, photobooks, party décor, recipe books, home décor, calendars and more! Being creative couldn't be easier! For only $45 NZD, discover a range of inspirational projects, ideas and techniques through project displays and engaging presentations. Just bring your laptop and digital images and follow along in our classes to create your own designer photobook-capturing your own cherished memories! You'll go home with several complete pages-which you can then print, e-mail or upload to the Internet. Classes are designed for beginners, to provide you with a basic understanding of My Digital Studio software.